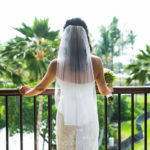 It is a privilege to do Hawaii wedding photography for a living. We love people and love being able to capture the moments on their special day; moments between family while getting ready, the first look, the vows, moments during the portrait times and of course the fun at the reception. One of my favorite elements of this wedding was the groom’s hat. The groom is a cowboy and it just didn’t seem right to him to not be wearing a hat, and so they went with a monogrammed hat with the bride and groom’s first initials. One of my favorite shots is when the groom took his hat off for prayer and held it while they held hands. The Mauna Lani Bay Hotel is a great location for a wedding with options on the beach, the grass, the vintage cottage or the fish ponds.